The Church Library is located in the Tabernacle room. The junior library section is stored in the wheeled trolley. Anyone is welcome to have a look through the bookshelf at any time. If you are interested in a particular Christian subject, or looking for a book of poems, prayers or verses, want a specific biography or just have a question then please just ask our librarian Margaret for advice. 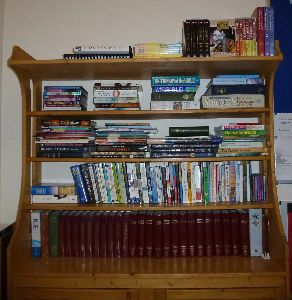 Everyone is welcome to look at and withdraw any, or as many, books as they are interested in at any time. We don't just have books either: we also have music CDs and DVDs! If you see something you want to borrow you do not need to wait. Just email the title and author to the librarian. Click here for email address. We don't have fines and we don't have deadlines. We are a not-for-profit organisation and we value inquiring minds. Come and check us out!